Are you visiting Belitung Island in the near future? Perhaps you have heard about a beautiful lake called Blue Kaolin. However, there are other options. 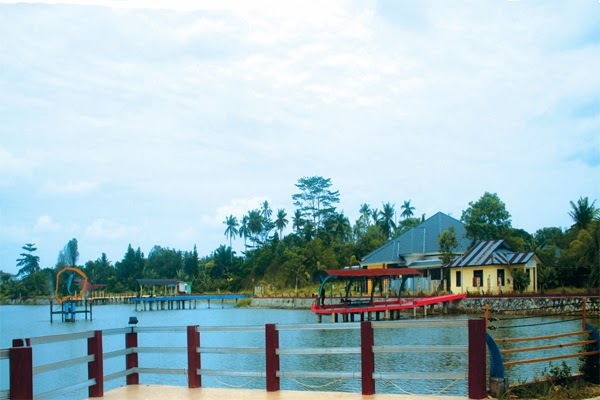 In Tanjung Pandan City, there is a historic lake called Keramik. The locals call it Kolong Keramik. Kolong means “lake”, actually. Today, it becomes an interesting vacation destination among local people. The location is in Ahmad Yani Street, Lesung Batang Village. It is open to the public, so you can spend much time there. There are also several facilities like souvenir stands, restaurants, etc. Keramik Lake radiates a solemn atmosphere. It combines stunning water and reliable facilities. The lake is surrounded by trees and plants. You can find some wooden docks, as well. They are quite colorful. Near to the lake, there is a building. It is the home of the keeper and government’s officers. The lake water is calm and fresh. One thing, it is rare to see people swimming in it. Perhaps the government doesn’t allow visitors to swim in it. Regardless of the reason, you should obey the rule. The first lure of Kolong Keramik is the history. It held an important role in Belitung’s tin mining. No wonder, some tourists come here to learn the story regarding this lake. John Francis Loudon was a key name back then. Also, it is said Keramik was the main water supply for nearby corporations. It is possible to gather facts about it. Once you reach the lake, you can ask information about the story of the lake. The locals are friendly, after all. Next, you can simply relax and enjoy the nuance of Keramik Lake. This area is suitable for hanging out. You may expect many visitors, especially in the afternoon. It is the time when people have come back from works. They want to replenish their mind in this location. You can also eradicate stresses by simply hanging out there. Moreover, many facilities are available there. These include docks and benches. If you want to buy items, there are souvenir stands nearby. Today, Kolong Keramik becomes an option for a vacation retreat. The government has altered this lake into a tour site. The best feature is water boom. There are different facilities both for kids and adults. Thus, you should come with your children. Once you enjoy some good times in that location, you can reach other vacation destinations. Your tour agency may prepare everything, so you can simply hop in the car. Since you are visiting Tanjung Pandan City, you must either use a ferry or an airplane. From Jakarta, your destination is Tanjung Pandan Port. It takes much time, though. In general, the trip from Jakarta to Belitung Island is almost 24 hours. The distance is up to 414 km. If you go by airplane, it is faster! From Soekarno-Hatta Airport, you need to head to Hanandjoeddin Airport in Belitung.